Crockpot Chicken Tacos with homemade taco seasoning is one of the easiest meals you can make for your family! Low carb option available! A great meal for the whole family that can easily be made low carb by using lettuce wraps. Check out my recipes for Homemade Taco Seasoning. The list of possible toppings is endless – lettuce, tomatoes, shredded cheese, black olives, salsa, sour cream the list goes on and on. 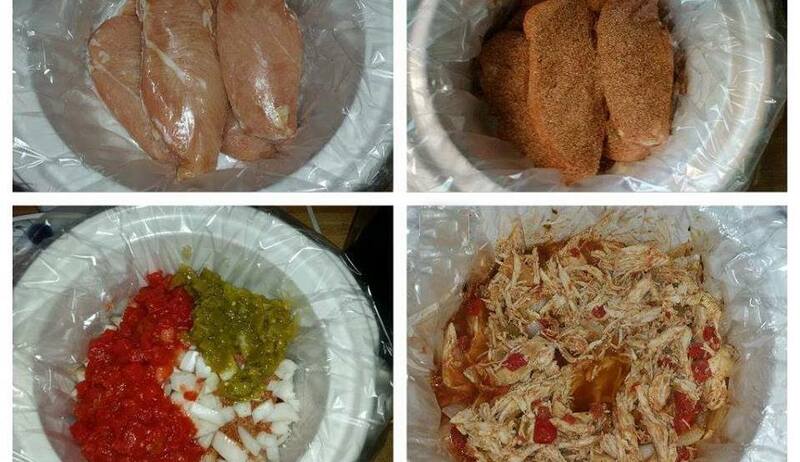 Place frozen chicken breasts in the bottom of crockpot. Sprinkle with taco seasoning. Top with diced tomatoes, copped onions and chopped chilies. Shred chicken with 2 forks. Add cilantro and stir. Serve on taco shells if you are low carb serve in lettuce wraps!